Since the 1994 Ceasefires, the people of Northern Ireland have continually been told by politicians, the media and economists that ‘peace will bring prosperity’ through Foreign Direct Investment, job creation and tourism. In October 2013, David Cameron employed this rhetoric at a major investment conference, saying: "What was seen this summer was a new Northern Ireland open for business, ready for investment, strengthening the foundations for peace, stability and prosperity and determined to be defined not by divided past but by shared future.” The truth is not so simple. What we have actually experienced over the last twenty years is a ‘double transition’; moving from a society of conflict towards one of peace, and from a largely social democratic economy to one wedded to neoliberal principles. As Dr. Conor McCabe describes in his article, The Double Transition:“The rent-seeking profit model of financialisation has been put forward as a solution – in fact it is often hailed as the only solution – to the deep social and cultural conflicts at the heart of Northern Irish society”. An exceptionally savage form of capitalism has emerged in Northern Ireland, while austerity is particularly severe. In 2013, the Northern Ireland Council for Voluntary Action (NICVA) published a research paper demonstrating how Northern Ireland will be hit harder by the government’s welfare reforms than any other part of the UK. Public sector cuts are set to take around £750m out the economy during the tax year 2015-16. This equates to £650 loss per annum to every working age adult. To put this in perspective, in Scotland it equates to £480, Wales £550 and London £520. The privatisation of the National Health Service is just one example of state privatisation, with £130 million being paid to the private sector to treat NHS patients over the past three years. Meanwhile, we have continued with the failed Private Finance Initiative programmes (PFIs), whereby funding for public infrastructure projects is financed through private capital. As has been proved time and again, PFI programmes in fact benefit overseas companies at the expense of domestic providers and actually inhibit private sector growth. And yet these free market polices, and attacks on some of the lowest paid workers, appear to be considered inseparable in Northern Ireland from ‘democracy’. We know that the most vulnerable suffer most from cuts to welfare, and this includes women. The authors of the NICVA paper reported that, “the large loss of income to Northern Ireland will have knock-on consequences for local spending and thus for local employment, which will add a further twist to a downward spiral. With a majority of women employed in the service sector this will obviously have a disproportionate effect on women.” This should be considered in the context of findings by the Women’s Resource and Development Agency in their 2011 ‘Women on the Edge’ report. The WRDA found that nearly half of full-time female employees in Northern Ireland were employed in public administration, education and health, compared with just 23 per cent of men. Overall, women accounted for almost two-thirds of the public sector workforce. Attacks on workers’ terms and conditions have also had a gender dimension, as 37 per cent of women worked part-time, compared with just 8 per cent of men, meaning the vast majority of all part-time employees were women. It is women who are mainly on zero hour contracts, with zero sick pay and zero holiday pay. How do you plan for childcare and other caring responsibilities when you don’t know how many hours you will be working or what you will be earning? How do you budget for the week? Women have been the biggest losers from public sector job losses and pay freezes, while zero hour contracts are pushing them and their families into insecurity and poverty. It’s no surprise that the fight back against these neoliberal cuts and reforms has been taken up by trade unions and the women’s movement. 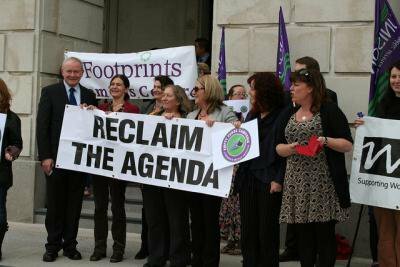 I belong to a group called Reclaim the Agenda, a collective of women sector representatives, grassroots feminist and trade union activists. We encourage and promote women’s activism through education, campaigning and celebration to create a fairer society. Our key demands are for a life free from poverty and discrimination, and from domestic and sexual violence and abuse. We demand healthcare services and childcare provision that meet our needs and to live in a world where women are equally represented as decision makers. The last twenty years has shown that the ‘peace and prosperity’ promise was a lie. Building a sustainable peaceful society will not be possible under neoliberal economic policies that see women rent their lives and those of their families from capitalists, the finance sector and estate agents. Almost 400,000 people now live in poverty in Northern Ireland (see this Joseph Rowntree Foundation report, 2014). Between 2007-08 and 2012-13, the unemployment rate almost doubled to 5.8 per cent. Those working part time because they cannot find full-time work rose from 1.7 per cent to 4.4 per cent. The proportion who are unemployed or ‘economically inactive’, but who would like to work, are both lower than in Great Britain, but this is as a result of higher rates of what is called ‘economic inactivity’. I spend the majority of my time with ordinary decent people in Northern Ireland who cannot exchange their labour for enough money to provide for their families. The jobs are simply not there or they cannot access or afford the limited childcare places. In 2010, Employers for Childcare reported: “Although to varying degrees, England, Wales and Scotland have seen an increase in childcare places since 2003, the results for Northern Ireland are not so positive. Between 2003 and 2009 there has been a 7% decrease in childcare places”. In March 2013 the Office of the First Minister and Deputy First Minister closed their consultation on a childcare strategy for Northern Ireland, so we will have to wait and see if the situation has improved. Women who cannot work, and who instead are caring for their children, as well as elderly parents and relatives, those with disabilities etc, have been categorised and indeed demonised as ‘economically inactive’. I wonder sometimes what the impact on the economy would be if these ‘economically inactive’ women decided to stay in bed for a week. I think it would demonstrate how quickly society would grind to a halt. Reclaim the Agenda campaigns for equality for all these women. Those involved have included members from WRDA, Women'sTEC, Alliance for Choice, Belfast Feminist Network, Belfast and District Trades Council, Footprints Women’s Centre, Windsor Women’s Centre, Shankill Women’s Centre, Youth Action, and Women’s Information Northern Ireland. We have held a number of successful protests against welfare reform under the working title of the ‘Empty Purse Campaign’. The campaign highlights how women are shouldering 75 per cent of the burden of welfare cuts, with the poorest being hit six times harder than the richest. 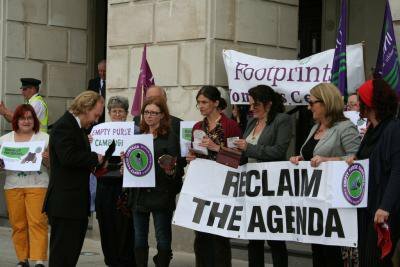 At one of our protests, we presented our 108 MLA’s at Stormont, Northern Ireland’s Assembly, with 108 empty purses. Each had a message inside that read “Protect Women and Children from Welfare Reform, Pay Universal Credit to the main carer’. Many of the political parties came out to meet us including the Green Party’s Stephen Agnew (pic below). Sinn Fein were ‘door stepped’ by some of our activists after launching the World Police and Fire Games. Now, after the European Elections when the parties should be focusing on the Welfare Reform Bill, First Minister Peter Robinson embroiling himself in support for an Islamophobic Pastor has pushed this down the agenda. Sinn Fein argue that they have resisted and worked against the worst excesses of Westminster austerity, having vetoed the Welfare Reform Bill. Yet they have come under serious pressure to sign off on it, and now Westminster has threatened the Assembly with £100 million in cuts due to their “failure” to reach an agreement. Empty Purse Campaign, Stormont, June 2013. All Rights Reserved. N.I. Green Party leader Stephen Agnew with campaign. All Rights Reserved. The media narrative in Northern Ireland is now that the green shoots of economic recovery are back with an increase in house prices, and a fall in the price of some food and fuel. However, those of us who have watched these bubbles expand and burst see an economic system that is imploding. In a post-conflict society like Northern Ireland we are not supposed to complain or question the rationale of economic policies. To do so means that we must want to return to the ‘bad old days’ or that we are ‘political dissenters’ and ‘nay sayers’. But where is this economic prosperity in Northern Ireland for the vast majority or ordinary women? While our society refuses to effectively deal with the legacy of the conflict, our present is only talked about through the sectarian prism of flags, emblems, and the hierarchy of victims. As for our future, there can never be genuine peace without women’s equal and full participation in all aspects of Northern Ireland society. This must include participation in the economy on an equal footing and within alternative, progressive and democratic economic systems.